We all know that the way candidates find roles is drastically different to how it was 10 years ago… even 5 years ago! Careers websites didn’t even exist! Candidates are no longer just trawling job boards or contacting recruitment agencies to find roles; they want you to find them! They want you to wow them, tell them why you are the right employer for them and make them feel that your values truly match their own. At Omni, we are passionate about understanding the candidates ‘psyche… and the changes in their (and our) mind-set to understand what they are doing to find their next role. Everything from multi-generational workplaces to the increased use of social media is changing a candidate’s journey when finding their next role. Motivations and drivers are different and, more so than ever, a candidate wants to not just be rewarded by money and benefits, but by a sense of “giving back” and being challenged in their role. The question is how can employers ensure potential talent can find out about their organisation? And not just what they do, but the real personality of their company? 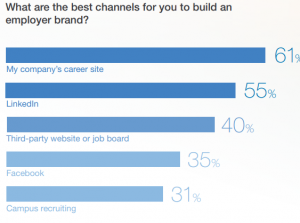 We know there are so many channels where candidates will look, but ultimately where will they land? Put simply…. it’s your careers website. What is a Careers Website? A careers website is landing page that not only lists your current vacancies but showcases you as an organisation. This is an opportunity for you to talk about who you are and what you stand for, ultimately to showcase your employer brand. According to the LinkedIn Global Recruitment Trends 2017 survey, this is what candidates want when they are considering a move. It’s not just about salary and compensation but what your culture and values are; and your mission and vision. Does your careers website clearly showcase these and in the right tone that fully reflects your employer brand? Once a candidate is made aware, in anyway, about a role, they don’t just apply, they research. According to LinkedIn Global Recruitment Trends 2017, before candidates apply 59% look up the companies website. Your careers website is going to be the first place that the majority of potential talent go before they will apply for your role. And according to the Talent Board Survey 2016-2017, 30% of candidates want even more information about why employees want to work for your company and more importantly, why they stay. Your employees are key to your potential hiring success; their stories and experiences are what will stand you apart from your competitors. Potential candidates will network around your organisation and identifying internal Brand Ambassadors is key to the success of this network. The success of any careers website is going to be how and where you promote it. Every industry is different in its priorities and audience profile but ultimately all should be utilising social media to push their messages out. 79% of jobseekers ** are likely to use social media to look for their next move. Not using this source can lead to a real loss of potential hiring talent. Are you doing enough to tap into this talent? Talent Ambassador Programmes are a great way for your employees to discuss working life and to put your organisation in the spotlight….for free! We know that the careers website is the key to building your employer brand, but social media is a very close second. Staff Engagement – your employees talking about their career development and time with your organisation is essential. Video content is great if possible. Values & Benefits – bring to life these and show how your company lives them. And don’t hide information about benefits – let potential candidates know what they will get if they work for you. We all know flexibility continues to be one of the biggest attraction benefits. Mission & Vision – this should not just be your mission statement but an opportunity to talk about the ‘why’ of your company – why do you exist. Check out Simon Sinek’s Ted talk***and think about how you can relate this to selling your company to candidates. Candidates want to make a difference in their lives and roles and they also want to see their employer doing the same. Responsive Design – 80% of job searches start on a mobile or tablet – a fully responsive design is essential. Call to action – Is it clear how a prospective candidate can apply for a role? How many clicks does it take for them to do so? Can they easily contact you and set up job alerts if there is nothing suitable at the moment? If not, it needs to be as once they’ve visited you and not seen anything it will be hard to get them back to your careers website! At Omni, we help SMEs develop fully responsive careers websites that provide a measurable return on investment. We can develop fully hosted sites from design templates allowing cost and time efficiencies. Contact us for an informal chat at enquiries@omnirms.com or click here for more information. How to choose the best HR & Recruitment Training Course?